Blue Door Farm Stand's new location at 2010 N. Halsted St.
LINCOLN PARK — After just a little more than a year in business, Blue Door Farm Stand is moving. But, don't worry. The farm-to-table cafe's new location is a short walk away and will be bigger than the original spot at 843 W. Armitage Ave. The original Blue Door's last day in business is Saturday May 30 and the new location is expected to reopen shortly after at 2010 N. Halsted St. The new Blue Door's first level will resemble the original location with a cafe-style format, while the second floor will be a full-service restaurant. 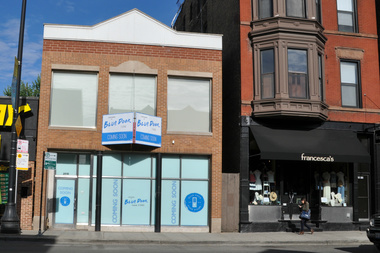 The Halsted Street Blue Door will have nearly double the square footage of the previous 2,000-square-foot location. “I know that whenever something moves, people jump to tell you how it is different," said Gabe Garza, president and partner at Ideology Entertainment. "However, I want to stress that this is an expansion." The second-level atrium will turn full-service with reservations during dinner hours. Garza said Blue Door "has simply outgrown our space." Ideology Entertain, which is owned by Chicago investor Fred Latsko, is the same group behind Chicago q and La Storia. Favorites such as the Brussels and kale salad, fig and arugula grilled cheese and sesame chicken salad will remain on the menu, which will also feature Bow Truss coffee and Harvest Juicery cold-pressed juices. The new location will also feature a full bar with cocktails crafted with the cold-pressed juices and spirits from local distillers. The original Blue Door will close its doors for good at 3 p.m. May 30.